Personally I don't like cards that require the opponent to have a certain type of card in their deck. The skill and icons are solid enough but at 3 cost they need to be, with a decent and not situational ability on top. His stats are reasonable, but the ability is lackluster. Most of the time he'll just be a French Vanilla dude, but there are better 3-drops in Agency with similar stats. 30/35 ancient one characters are villainous, this card adds protection against the really nasty things that agency struggle with. Combined with basilica he can be a real pain for some decks. 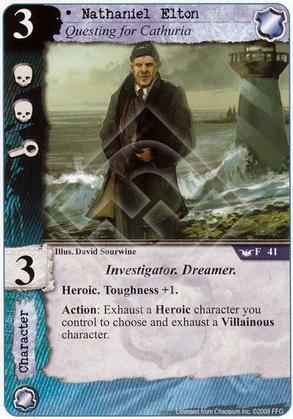 Stats are average but he has the investigator subtype, a bit bland in a matchup where you don't get to trigger him.